Why has the mirror fascinated so many humans for thousands of years? Usually we only glance into a mirror while combing our hair. We don’t really look at ourselves that deeply; we tend to focus on only one aspect at a time. But, if you pause for a moment and stare intently into a mirror, what do you see? It is talking about how we perceive ourselves and our surroundings and ultimately, how we fail to see that life reflects us back to ourselves. By continuously looking out the window and putting the ‘blame’ on others we fail to utilize all the power in the moment. Every time we look into a mirror we see something which is marvelous, wonderful and mysterious. The mystery lies not only in the image and its reflection, but in the mirror itself, the thing which it reflects, the purpose which it serves, and that which it symbolizes. The oracle of Apollo at Delphi demanded of the ancient Greek ‘know thyself,’ and mirrors have often been used as symbols of wisdom and self-knowledge. Gradually however the mirror came to be associated with the negative values suggested by the myth of Narcissus. Vanity and Deception rather than Truth and Prudence were the connotations the mirror carried most often from the Renaissance on. Like most things which are necessary to civilization, we accept mirrors as simple and useful contrivances and regard them as common pieces of furniture. Mirrors have always been held in high esteem by the ancients and considered to be magical, mysterious and sacred. Prior to the thirteenth century the art of the manufacture of mirrors was unknown in Europe, and for centuries the secret of the manufacture was guarded jealously by those in possession of it. Copper, silver and steel were at first used as mirrors by being brought to a high polish. Later it was discovered that glass would serve the same purpose when backed by amalgams of such metals as tin, lead, zinc and silver. Today, we can hardly pass by a mirror without pausing to look at ourselves; to see how we look—and, even more importantly, how others might see us. For us simple self-recognition has developed into a strong sense of a personal self, a unique “me” that is experiencing events, making choices, and actively engaging with the world. This sense of self in human beings is much stronger than in apes or elephants. Why do we have this sense of “I”. Where has this feeling of personal being come from? Billions of years prepared planet earth for life and for human consciousness. A unique combination of elements in the evolutionary process eventually birthed human life. Evolution can be seen as the universe in search of itself. Our appearance as humans allows the universe to move to a deeper level. It can now search for the heart of itself: God – the living flame of love who energizes, transforms and glorifies all that is. Mirroring is an image found in the myths of primitive peoples. World religions have mirroring stories describing the human – divine relationship. In mystical writings it is a recurring symbol. The image of the mirror is deeply engraved in the human psyche. It is an image of human – cosmic connectedness. So, what is it that we call a reflection?, is it a shadow? No. But even if it is a shadow, what is a shadow? The main role a mirror serves today and that for which it is mostly used is to check our clothes and to see how we appear to others. But, a mirror is the symbol of illusion; the unreal as distinguished from the real. A human is not merely what we see outside in the physical form but his true self lies inside with his soul. The human body exists in the physical world of space and matter whereas the soul is the resident of the spiritual lands. Each person differs from every other person in complexion, figure and features, but in degree only. The human likeness is reflected by all. A nose is a nose whether it is stubbed or pointed, flat or round, swollen or thin, long or short, blotched or smooth, ruddy or pale; an eye is an eye whether it is brown, blue or black, almond or ball shaped. It may be dull, liquid, fiery, watery, but it is still an eye. An ear may be elephantine or diminutive in its proportions, with tracings and colorings as delicate as an ocean shell or as gross and heavy as a piece of pale liver, yet it is an ear. The lips may be shown by strong, gentle or sharp curves and lines; a mouth might appear as a rough or coarse cut in the face; it is a mouth nevertheless, and may emit sounds to delight the fabled gods or even terrify their brothers, the devils. The features are human and represent so many variants and reflections of the many-sided human nature of man. Human beings are so many types or phases of the nature of man which is mirrored forth in the multitude of the reflections of the sides or different aspects of humanity. Humanity is a man, male-female, who is not seen, who does not see itself except by its two-sided reflections, called man and woman. Wherever man goes, there he projects or reflects from himself, the images which flit through his mind. So hamlets, villages or great governments are built up, all of the architectural structures, sculpture, paintings, music, all designs, clothing, tapestry, houses, temples and huts, the daily papers, the magazines, or books, legends, myths and religions, all are the putting into evidence in this world by means of the mirrors of man those things which exist as pictures or ideals in his mind. Each of us is an utterly unique reflection of the divine. Every moment we can choose to see ourselves, every other, our world and cosmos as Sacred Mirrors, opportunities to recognize God’s presence. Although it appears to be simple enough in itself, a mirror is a mysterious and magical thing and performs one of the most necessary and important functions in this physical world. Without mirrors it would be impossible for the Ego to be conscious of any of the manifested worlds, or for the worlds to become manifested. It is by creation, emanation, refraction and reflection that the unmanifested becomes manifested. If we stand before a mirror clothed in rags the mirror holds the reflection of our rags, but it is not itself in misery. If we stand before the mirror covered with pearls and diamonds the reflection of our pearls and diamonds falls upon the mirror, but the mirror does not turn into diamonds or pearls. So is it with the soul: it is neither a sinner nor is it virtuous; it is neither rich nor poor. All life’s joy and sorrow, ups and downs, are reflected for the time being upon the curtain of the soul, and after a time pass away. Therefore both the joy and sorrow of yesterday are nothing to us today. The work of the soul is to know and to see, and the work of the mind and body is to act as a magnifying glass for it. Psychologists and psychotherapists have long emphasized the importance of authentic mirroring in childhood development. Without this the young human being cannot experience a true sense of self, of his own inner being. We all live on a shifting frontier between truth and fiction. Memories are a collaboration between past and present. The events of our lives are shaped by the dreams, fantasies and beliefs that circle them and vice versa. The concept that the mirror actively ‘saw’, rather than simply reflected a living image, occurs early in Egypt. The mirror’s capacity to observe and to ‘see’ the face, capturing and maintaining the essence of the person reflected, is a conceptual variation which takes us into the ancient Egyptian mindset in a world we cannot easily comprehend. The term most often used for ‘mirror’, “anx”, also means “life”, with perhaps a play on words ‘reflected’ in the mirror’s role in preserving the image in a state of continual existence. In early Egypt most people would have viewed their reflection in water. It was not long however before Egyptians, in their eternal quest for perfection, found a more efficient method of achieving reflection. 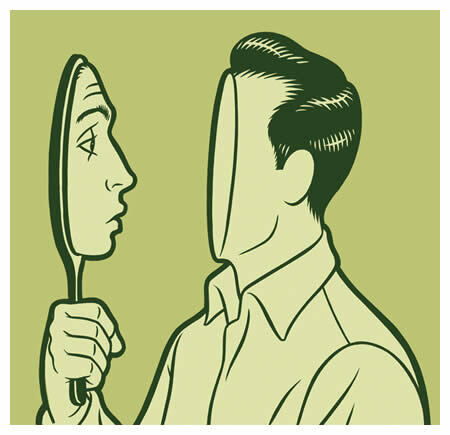 The ability to self-reflect makes us wonderfully human and underlies the best features of civilization but it also creates havoc by fostering selfishness, suffering, troubled relationships, disastrous decisions and behavior that is dangerous to ourselves and to others. The earliest conceptual awareness of the ‘individual self’ has received close attention in recent anthropological and archaeological investigations into ancient peoples, (Hodder, 2000). Today, it is hard to avoid images of oneself, caught in mirrors and in reflections from the modern world which surrounds us. In antiquity, concepts of the self developed gradually through the prehistoric period until the Bronze Age. But, self-reflection, the uniquely human ability to think about past mistakes, plan for the future and take steps toward self-improvement, seems like a blessing. However, it is also a curse, says Mark Leary, professor and chair of psychology at Wake Forest University. The self can also be detrimental when egocentric views lead to conflicts with others. Few people realize how profoundly their lives are affected by their self-thoughts or how frequently this inner chatter interferes with their success, pollutes their personal relationships and undermines their happiness. When individuals try to defend their egos, they often act as if their ego is a real thing rather than just a mental image they have of themselves. The Great Wisdom masters and traditions hold up a sacred mirror of the universal light of love. Reflection is clarified attunement to the cosmic symbolism in life and recognition of the God-self in everyone. When sacred mirrors face each other, the infinite is revealed. Reflection then, is seeing as a spiritual practice. If you are ever unsure of yourself or how people may perceive you, look around. The world is constantly exposing you to the true nature of your inner being. Recognize the types of individuals you are attracting into your life. Realize how they make you feel (positive and negative). Nourish those attributes you find appealing and use the others as contrast for what you wish to see changed within yourself. As we learn to look for that reflection in the mirror rather than to project our senses outwards we can gain a sense of responsibility for our own lives. If we see that our negative feelings towards others are reflecting back to ourselves our own sense of negativity then we can do something to help ourselves forward. If people better understand how the mind naturally works, says Leary, the self can become an ally rather than an enemy. Compelling us to discover how we are all connected, and to shift from a culture of “me” to “we”. Don’t forget that our children learn from what we do, not from what we say. If our example displays that acquiring money is more important than anything else and includes our turning a blind eye or an apathetic view to the injustices in society, corruption in business and government, then this is what our children learn. We have seen countless examples over the last year in banks, exchanges, and governments, an endless amount of news items about global social catastrophes taking place every moment, so what are we waiting for exactly? On one hand people are getting killed every day in the Middle East and Africa, hunger and malnutrition are rampant worldwide, we are robbing nature of its most precious resources as if there is no tomorrow, and so many other things indicate we are lacking direction in our lives and a suitable response to these ongoing concerns. On the other hand, the escalating violence occurring in our schools is really a small matter in comparison to the rest of our global problems. But that could not be further from the truth. The suffering and lack of satisfaction of the younger generation is the clearest sign we have of just how much we have failed and of how little we have to offer them in the current reality. All the evils of modern society are manifested in our children at school in the cruelest possible manner. We need to start doing something about this immediately because this is our children we are talking about. The escalating violence and growing number of shootings taking place in our schools are providing us with a red line that should never have been crossed. Throughout the world and especially in the U.S., there is a growing phenomenon of aggression between students, between teachers and students, parents and coaches, and even parents and students. But the saddest of all are the cases of shootings and killings that occur in the schools themselves. The general state of the educational system actually symbolizes the exact opposite form of the global integral era we are meant to be entering. Integral means whole, a system where each part is essential or necessary for completeness. Despite our good intentions, our children see life as a competition to be the best, richest, and most successful. Achieving that ‘natural high’ that comes with being on top typically requires putting down the people around you. Society’s glorification of all the wrong values has reached a peak and that is what we are currently witnessing in our schools. We have failed in our attempt to give our children a humane education because we behave contrary to those values. We cannot even set a proper example for our children. The foundation of a truly valuable education is providing a good example for kids to follow. Unfortunately, even the highest-quality education cannot countermand the negative examples we provide in today’s societal environment. All the humane values we wanted our children to have should have been implemented first and foremost by us in our family life, in our society, economy and politics. All of these areas of our lives should have been based on mutuality and collective responsibility, concern and care for one another. Since these are values we want to instill in our children, they should be present in the home life and all other aspects of society. But, they are not. And, we cannot expect our children to run the world. It is actually our complete responsibility to shape our youth for their life here in this world. Math and physics lessons are nice and useful but are not worth anything if a child reaches a state where he needs to kill one of his classmates. What have we prepared him for, what kind of education did he receive? Did we provide him with what he really needs? If we had, would he still have needed to commit the frightening atrocity at school? There are so many questions that place our responsibility and neglect of deteriorating circumstances right at the top of the public agenda. The truth is that the hardest part to digest is not just what happened, but the lack of reaction to what is happening. That is the most deplorable aspect of this scenario. The child-parent circle engulfs most of the world so this issue really involves everyone. No one in society can excuse themselves from this process. If anyone imagines for a second that at this critical juncture in our lives we can ignore all the negative signs and allow our children to continue to suffer instead of receiving the education they deserve, we are in for a big wake up call. We have only ourselves to blame, and hopefully more and more people will realize that education is everyone’s responsibility and really does begin at home. It is unrealistic to work 12 hours a day, be caught up in the rat race, hand-off your child to some institutional framework every day, and expect some miraculous upbringing to occur. The individualistic driven world we have become accustomed to is coming apart at the seams, along with all the systems connected to it. Dealing with an economic system on the verge of collapse, countries on the verge of bankruptcy, or a political system serving personal interest is sad, but we continue to put up with them, although we may make significant changes sometime in the future. Yet dealing with the far-reaching consequences of a deficient education system and its casualties is another story altogether. This impacts not only the current students, our children, but also defines the nature of society for years to come. But, self-knowledge is hard to gain. And, there’s a problem: just as the eye is not able to turn its power of vision back onto itself to see itself, so we are not able to turn our conscious awareness (our power of knowing) back on ourselves to know ourselves. To see itself, the eye needs a mirror. To know ourselves, we need mirrors too. Throughout history, nature has been our mirror by both her example and way of being. However, the need to control prune and cut down nature has been endemic in our culture since we entered the mechanistic age where machines were used to dominate nature so that its energies and fruits could be harnessed to fuel our hunger for money and power. Understandably, there is a lot of unconscious fear towards the natural world because it can take us over and will keep on growing and multiplying long after we have lived our little life on earth. The fear of nature and the wild emerges from our refusal to accept our own wild, dynamic beauty. But, we now stand on the brink of annihilation as a race unless we change our ways and work with nature and learn to respect her presence here on earth as provider and home maker. We are dependent on nature for our survival and on her continuity. Nature is not dependent on us. Nature was here before us and will be here long after we have passed away. Until we can accept that we are not only dependent on the natural environment for our nourishment and continuity, but we are also an integral part of it, we will always fall short of our potential on this planet. This entry was posted in Uncategorized and tagged Accessories, Amazing Apes, Carol Tuttle, Christina Aquilera, CNN, Deception of reflection, Delphi, Home and Garden, human, If Mirrors Could Speak, Jennifer Lopez, Justin Timberlake, Man in the Mirror, michael jackson, mind, Mindfulness and Neural Integration, Mirror, Philosophy of LIberty, Reflection (physics), Religion and Spirituality, Renaissance, Self Ownership, Self reflection, Self-awareness, Shopping, Ted Talks, Wake Forest. Bookmark the permalink. 1 Response to You Mirror What The World Mirrors To You.